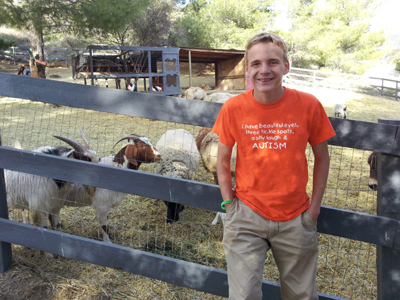 Guest blogger Elaine Hall, creator of the Miracle Project, on raising her autistic son. Spring is finally here, and with the coming of warmer temperatures and longer days, the humble egg, once again, is promoted from morning-mundane to sacred icon. Whether being roasted and prominently displayed in Jewish homes on the Passover Seder plate, or hidden and searched for in joyous Easter egg hunts, the egg is transformed. During the holiday season, usually in April, we will celebrate miracles. Rebirth. Renewal. Redemption. How timely that we also celebrate Autism Awareness Month in April. Autism, for just this one month, also leaves its secluded ubiquity to take stage in our communities’ public forums. Autism Speaks encourages us to “light it up blue,” and the world gets a glimpse of the challenges and joys of families journeying with raising a child with autism. A little over sixteen years ago, coincidentally, when I received the sad news that my womb would never become a home to my “biological eggs,” I began a new journey. In the month of April 1996, I adopted my now almost 18-year-old son, Neal, from a Russian orphanage when he was 2 years old. He was malnourished and had liver toxicity; he spun around in circles, stared at this hands, banged his head on the floor, never slept, rarely visually referenced others, and he could tantrum for hours. At the time, I thought all of these disconcerting behaviors were attributable to deprivation in the orphanage. Today we know the signs of Autism - once diagnosed 1 in 10,000, today diagnosed in an astonishing 1 in 110. In less than a year, Neal grew physically healthy, but he did not “catch up” developmentally. Shortly before his 3rd birthday, he was diagnosed with severe sensory dysfunction, mental retardation, and severe, nonverbal autism. Soon after, the well-meaning question from friends and family came my way, “Didn’t they tell you,” followed by the crushingly insensitive suggestion from a few, “Send him back.” “He’s my son!” I would respond. After a few weeks of reeling from this “advice”, I jumped into action. I sought therapists and ‘cures’ from wherever I could find them. When traditional behavioral treatments did not seem to work for Neal, I turned to the esteemed Dr. Stanley Greenspan (may he rest in peace), who encouraged me to understand Neal’s sensory system, to follow his lead, to join his world, and then to challenge him with adult directed activities. At the time, this methodology was seen as unconventional, so I sought out my friends, actors, musicians, dancers, and other creative people to join Neal’s world 10 hours a day, 7 days a week, until Neal slowly emerged into our world. These methods coalesced into the fundamental approach for The Miracle Project, a theater program I created for children of all abilities, profiled in the HBO film, AUTISM: The Musical. I later chronicled this journey in my memoir, Now I See the Moon, and formulated this methodology into Seven Keys to Unlock Autism (co-authored with Diane Isaacs). Today, Neal is a happy, joyous, calm, peaceful, and still nonverbal, but extremely intelligent young man, who uses an iPod touch, iPad, and sign language to communicate with the world. He is adventurous and capable of so many things. Our task now is readying him for adulthood and independence. One of the common challenges with autism is motor planning and sequencing. To assist Neal with this challenge, every single task must be broken down into small, incremental steps so that he can map on (learn) to do the task. For the past few months, my husband, Neal’s stepfather, Jeff, has been teaching Neal simple cooking tasks. One of which is boiling an egg. Since Neal enjoys eating three hardboiled eggs for breakfast lately most every morning, it seemed appropriate that Jeff would start his cooking lessons with learning to boil eggs. Think about all of the different tasks it takes to boil an egg: Get the pot, fill with water (Neal learned on his own the right amount), take the eggs out of the refrigerator, place eggs ‘gently’ into the pot, turn the fire on, wait 10 minutes, etc., etc., etc. This simple task took months to learn. With the exception of a few broken eggs and several undercooked yolks ending up in the bottom of the sink (Neal never forgot to turn off the burner and use a pot holder), Neal mastered this task and had become our morning chef, even adding another egg in the pot each morning for me. A few mornings ago, as I was frantically working against a deadline for a grant proposal, Neal motioned to me that we were out of eggs. Pressed for time, I couldn’t go to the store and get them. For the past few weeks, Neal had been working with Ryan, one of his coaches, on going into a store and buying an item on his own. Ryan would wait outside and Neal would return with an apple, or an energy bar. “Hmm, maybe Neal could go get us some eggs?” I thought. “Dare I risk this? If not now, when?” I called Neal over to me and asked him if he wanted to go to the store down the street and buy eggs by himself. He signed ‘yes’ and smiled. “Okay,” I said, and reached into my wallet to hand Neal a five-dollar bill. I instructed him to use his iPod touch to let the man at the counter know he wanted eggs, and then to pay for them and bring back the eggs, the change, and receipt. I held my breath as Neal walked out the door. I called the store in advance to let them know that Neal was coming in, and then asked them to call me when he left. I clutched my keyboard, not being able to concentrate on the grant proposal – so I reached out to my Facebook friends to calm my anxiety. In less than 15 minutes, Neal returned with the eggs, the change, and the proudest look on his face I had ever seen. He was beaming! And so was I.
Neal’s triumphant egg-hunt, which would be viewed as one small step for a ‘typically developing’18-year-old, was a giant leap toward independence for my sweet son with severe autism. Neal is a constant reminder to our family that the miraculous occurs every day if we’re willing to risk breaking a few eggs. Wishing you and your family a blessed holiday. May we all continue to embrace the miracles in each and every moment. Elaine Hall ("Coach E") is the creator of The Miracle Project. She is the author of the memoir Now I See the Moon which was chosen by the United Nations for World Autism Awareness Day and co-author of Seven Keys to Unlock Autism: Making Miracles in the Classroom. The methods Elaine developed to reach kids with autism were profiled in the Emmy Award winning HBO documentary, Autism: The Musical. Elaine directs an arts enrichment and bar/bat mitzvah program at Vista Del Mar in L.A. She lives in L.A. with the two loves of her life, her son Neal, and husband Jeff Frymer, a play therapist. Read all our posts about autism here. Plus, share your experiences with autism, or raising an autistic child, in the comments below.